Former OU Sooners players were hot items in the first round of the NFL Draft, which took place this evening. 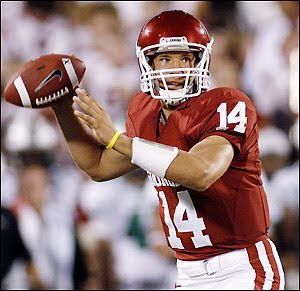 Quarterback Sam Bradford was the first pick, going to the St. Louis Rams. He became the first quarterback from the Big 12 to be the first draft choice. Number two went to Ndamukong Suh of Nebraska. Number three was defensive tackle Gerald McCoy of OU, who went to the Tampa Bay Buccaneers. Number four was offensive lineman Trent Williams of OU, who was chosen by the Washington Redskins. Also picked in the first round were Russell Okung of Oklahoma State (number 6), Jermaine Gresham of OU (pick number 21), Dez Bryant of OSU (number 24), and Tim Tebow of Florida (number 25).